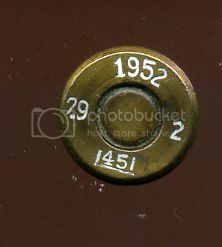 I also have one of those rimmed 9mm revolver rounds, but I forgot to log the headstamp. I did post a pic on it, however. Any chance of seeing the pics for the 451, 641 and 948 headstamps? i have never seen these and am missing these ones. Would be greatly appreciated. Jon, thanks, could you give the years per caliber as well? That will have to wait for more time to be available. Subsequent to this posting, I’ve had the opportunity to shoot one - it felt equivalent to a underpowered 38 S&W. I’ll review my collection of cases and see if there’s anything not already posted. Will, thanks a lot, now I can associate years to the data I had. Thanks Will, It is great to get some pics of these hard to find headstamps. I think Lew Curtis wrote a article for the IAA Journal on Chinese headstamps but I do not remember the Journal # and I cannot get to my copy right now. Perhaps someone else can provide that info. Lew did have a great article. You can find it on line using a google search for Chinese headstamps. This posting though we were looking for specific headstamps and pics of them as many have a great deal of talk about them in many forums and books, but no pictures that we have seen. Trying to establish with 100% proof these exist. Anyone have any more of these? Sorry forgot to add that.,.it is 7,62x39mm…so make the dates now 1971-1977. I recently received a batch of the little airplane models made of Chinese cartridge cases. 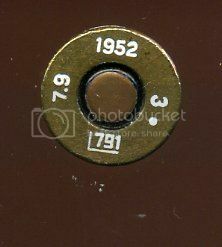 There were some 5.8x21 cases with 74 headstamps, and a date of 14, which seems a new date to the lists of headstamps for that caliber that I have seen, although I guess we should expect that each year in recent history will exist for that caliber anyway. These models are also all based around a 7.62x54r cartridge with a headstamp that I don’t recall seeing, and it looks more like a commercial / retail style of headstamp than military.